Don’t miss the most exciting series of the summer – Provelo! Provelo bike picnics, put on by the Provo Bicycle Committee, are a chance for everyone to get together and enjoy a good time with some truly outstanding company. What: Provelo Bike Picnic. Pack your dinner and pedal on down to the park. When: Saturday, July 31, 2010. 6:00 p.m.
Take a look at the recap of the June Provelo to see how much fun these picnics are. 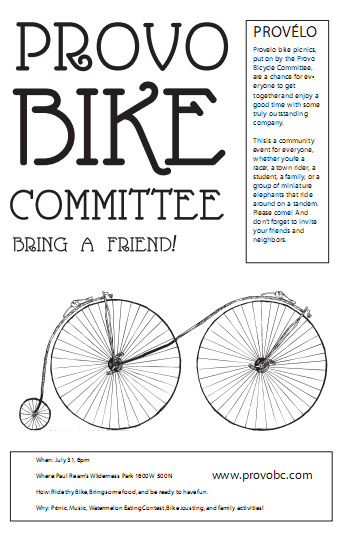 This is a community event for everyone, whether you’re a racer, a town rider, a student, a family, or a group of miniature elephants that ride around on a tandem. Please come! (Also, take a look at the Provelo Facebook Event page). This entry was posted in Kids and Family Cycling, Local Biking Events, Provo Bike Committee by Jamie. Bookmark the permalink.